Did you know that you can add far more kitchen storage with the help of Clicbox? Clicbox is an innovative way to quickly and easily add more storage to your kitchen and is perfect for homeowners and landlords who need a fast and effective solution. To put it in simple terms: Clicbox is a range of flat pack kitchen cabinets that can easily and quickly be fitted together to create a customised level of storage that suits you and your home perfectly. It’s one of the leading up and coming storage solutions, and you’re bound to find something that works in your home from the range. What are the benefits of Clicbox to homeowners and landlords? There are numerous benefits to homeowners and landlords when it comes to Clicbox storage solutions. Easy assembly means that you can have your storage up and running up to 5 times faster than other storage solutions. That means more time to spend on other things. No tools, no glue, and no fittings are required to fix your Clicbox storage together, so you don’t have to worry about using things you’re not confident with or getting confused. The items are super easy to transport & handle, and less components to fit together is always a bonus. 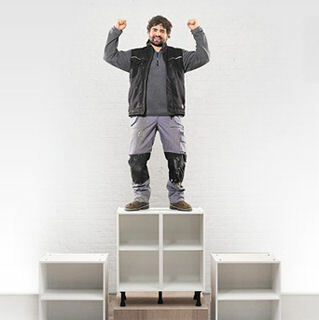 On top of all of this, the Clicbox solution is stronger than traditional carcases out there, so you won’t need to worry about them breaking apart or not lasting. Delivery is available in 3-5 days for those who are interested in the Clicbox storage range, and this is free on orders over £300 – perfect for your own home or landlords who want a better solution in their various properties. As Clicbox is so easy to build, you won’t need to call in outside help. You can easily do this yourself in next to no time, saving you money further. Clicbox items start from just £30.52. Buying multiple pieces can mean you save on delivery fees, and the fact that you can put these up yourself means you save even more money. Ultimately, Clicbox offers real value to customers. There are many Clicbox styles to choose from. The great thing about any Clicbox piece is that they can blend into any existing kitchen range, so it doesn’t matter what you have now or where it’s from. 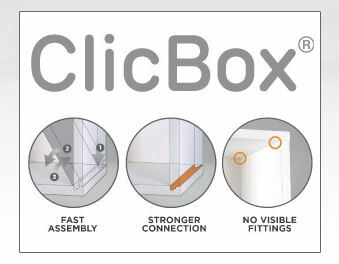 Your Clicbox solution can fit in perfectly! Colours include white, ivory and lissa oak, and you can choose from high gloss and matt finishes. Traditional and woodgrain, as well as handpainted options are also available. At Hot Doors, we’re sure that you’ll find a storage solution to suit you in the Clicbox range, so don’t hesitate to get in touch today. Our team can give you more information and even advise you on the best steps to take next. You can never have too much storage in your kitchen, and Clicbox is one of the best solutions out there.